The CIA-meeting in Heidelberg, 1967, organized so splendidly by Klaus Rother and his group, was my first CIA-meeting to attend. Since then I am a fan of this institution. There is an old song "I have lost my heart in Heidelberg", this holds true for me with regard to the CIA! I had to wait two terms before I got the honour to become a member at the Konstanz meeting organized by Peter Dukor and Alain de Weck. The election of the candidates was - as always - very secret, in fact, I was not sure whether I would be elected this time or not; I was sitting at a table at the very end of the hall and when Alain de Weck called the names, I didn’t really understand acoustically, although it sounded like my name, I rather felt that I was called by Alain de Weck and went there, fortunately correctly - to become a member. 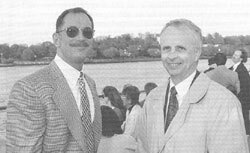 So from my early days and until recently the secretary of the CIA was Alain de Weck who was running the business while a row of presidents - very famous names - were passing by. Alain de Weck had taken in this office from the founder of the CIA Paul Kallós, whom I have had the luck to meet personally at several occasions. Paul Kallós was the editor of the "International Archives of Allergy and applied Immunology" and he did a great job in this especially with regard to young scientists. I still keep some of his letters where he commented my papers: even when a paper was rejected he would write a positive letter and give friendly and constructive suggestions. This correspondence was very important for me in my scientific career. Today, usually you get a computer letter without any meaning or personal input. Editors all over the world still could learn from Paul Kallós! After Alain de Weck the duty of the official secretary was taken over by John Bienenstock, I got the honour to be honorary secretary after André Capron, who had organized the famous Martinique meeting. Since two years (at the Nuntucket meeting organized by Stephen Galli and Frank Austen) this distinction between executive and honorary secretary has been ended and transformed into a "secretary general". The good thing about it is that at the same time we have found a secretarial office with Rick Iber and Kate Anderson, who are doing most of the secretarial work in an excellent fashion! So be it honorary, executive or general - secretary of the CIA is a real honour for a clinical scientist. The spirit of friendship that I have found from the very beginning in the CIA and in the CIA council is overwhelming and I will do my best to keep up with this tradition regarding younger members for the future!